Someone please tell me why Twitter thought it was a good idea to put the ‘Accept’ button right on top of the ‘Block username’ link on their web interface? It’s caught me out on more than one occasion and to this day I still haven’t figured out how to ‘unblock’ a user. Dear Twitter, please fix! In fact, I’ll do the work & give it to you for free, just stick this line into your CSS, you don’t even have to touch your HTML as it’s already being referenced!!! Jason is taking the BTW event to Cork today at the Boardwalk Bar & Grill at 6pm. I was at the last one in Dublin and it was a fantastic informal meetup of a great mix of people from various walks of the online world most of whom I probably wouldn’t have met ‘offline’ otherwise. There’s some tasty badges on offer too if you need further reason to attend Would love to have been there but Cork will have its’ claim over me next weekend instead for the International Choral Festival which I will be posting about later on. Directions for how to get there. Have a great evening all! Stu’s virus is getting contagious. Ridiculously so. I can’t help but think of songs as bloody alert boxes now. Some really awesome ones over on the Buzzfeed page, expect more later. And about 15 mins later I had another one, good God help me. I was up and out early this morning for the filming of a dance scene for Ireland’s first bollywood movie today (awesome fun, post coming later). 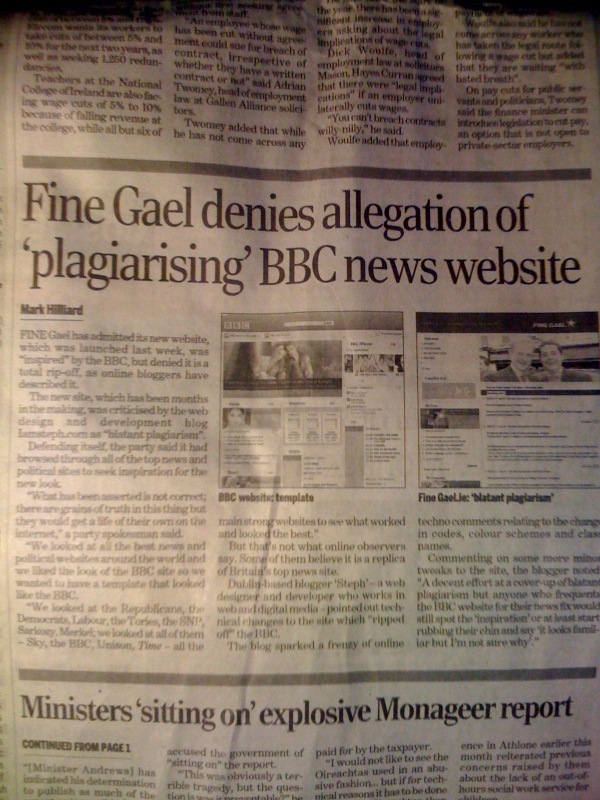 Glancing in on Twitter during rehearsals I found out that the posts I had written about the Fine Gael website had made page 2 of the Sunday Tribune. I’m still disappointed and quite annoyed with how the party have handled the incident. FG don’t realise that they’ve missed the boat completely in terms of communication with voters & getting their message out there ahead of the local elections and in time, maybe even a general election before long. Their attitude towards the Internet and the online community (from bloggers to developers) is archaic and worryingly ignorant. I’d normally wish someone luck at this juncture (considering the mountain that they have to climb) but the feeling of disrespect is now a mutual one so they won’t be getting any best wishes (or votes) from this citizen.